Get Your Restaurant Found on the Internet. Don't rely on customer feedback services like Yelp, Take Control of your web presence. Customers want to visit your restaurant and they use Google, Bing, Siri and Cortana to find you. Why limit your business? Without a website, you cannot be found by these services. Customers have told us the most frustrating part of finding a restaurant is locating their address; one tap of the smart phone screen will generate driving directions to you. We share your hours. Customers know when you’re open, so they don’t hesitate to come visit. CreativeHydra’s SMB sites bring customers to your door. Your phone number, top and center and easy to find. One tap of a smartphone screen and customers can call you and place an order. 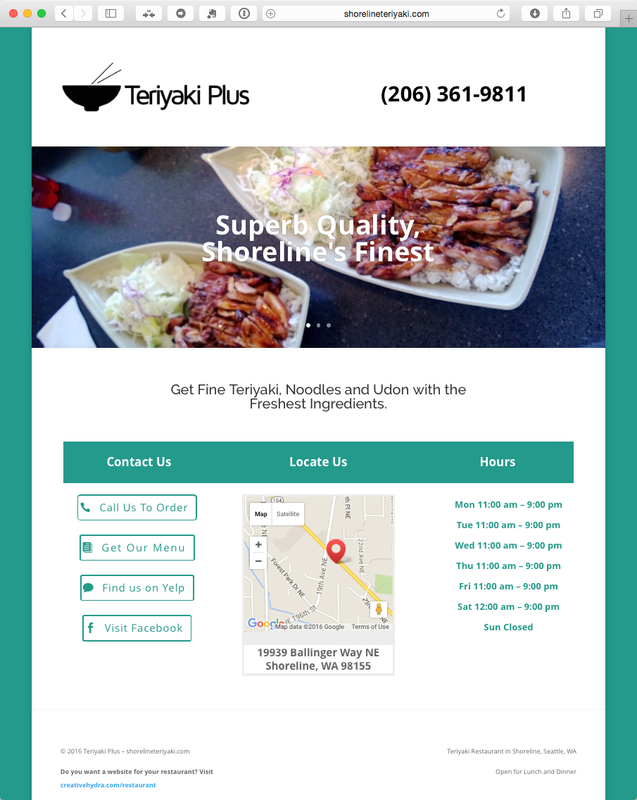 Your menu is included and easy for customers to locate. Customers can even download a copy to order from you over and over. Call now and get your complete website with domain name for the introductory price of $199. Be Found by Where Customers Search: Google, Bing, Siri, Cortana and other search services.